FIIs were net sellers of equity on Mon. (Feb 4), but net buyers on Tue. and Wed. (Feb 5 and 6). Their total net buying was worth Rs 10.0 Billion. DIIs were also net sellers of equity on Mon., but net buyers on Tue. and Wed. Their total net buying was worth Rs 6.5 Billion, as per provisional figures. After slipping to 53.2 in Dec ’18, Nikkei India’s Manufacturing PMI rose to 53.9 in Jan ’19 – staying above the 50 mark (indicating growth) for the 18th straight month. However, Nikkei India’s Services PMI declined to 52.2 in Jan ’19 from 53.2 in Dec ’18. The Composite PMI (Manufacturing+Services) was at 53.6 in Jan ’19 – the same as in Dec ’18. Passenger vehicle sales remained sluggish in Jan ’19. While Honda showed 23% growth, Maruti, Hyundai, M&M sales were flat. Tata Motors, Toyota, Ford Renault, Volkswagen showed degrowth. In Commercial Vehicles, Ashok Leyland and M&M showed sales growth; Tata Motors showed degrowth. Bulls have turned the tables on bears during the first three trading days this week. The daily bar chart pattern of Nifty bounced up after receiving good support from its 20 day SMA (dotted blue line) and closed above the 11000 level after four months. Combined net buying by FIIs and DIIs after the interim budget on Feb 1 has propelled the index above the 400 points trading range of the past couple of months. Buying in a few large cap stocks have led to Nifty’s rally. A convincing close above 11090 – which is the Fibonacci 61.8% retracement level of the 1756 points correction from the Aug ’18 top of 11760 to the Oct ’18 low of 10004 – will put bulls firmly in control of Nifty’s chart. Daily technical indicators are in bullish zones and showing upward momentum. MACD has crossed above its signal line and entered bullish zone. RSI is rising above its 50% level. Slow stochastic has entered its overbought zone. Some more upside is possible. Note that MACD and Slow stochastic are showing negative divergences by touching lower tops. 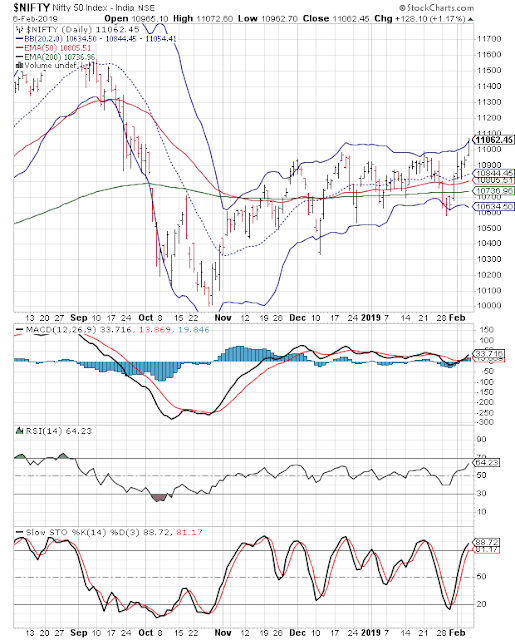 The index closed above the upper Bollinger Band today, which can cap the upside. Market breadth has been negative, with declines exceeding advancing shares. Bears are by no means out of the picture. Nifty’s TTM P/E has moved up to 27.39 – its highest level in 2019 and much higher than its long-term average in overbought zone. The breadth indicator NSE TRIN (not shown) is falling in neutral zone – hinting at some near-term upside. Possibility of an interest rate cut of 25 bps (0.25%) by RBI on Feb 7 appears to have enthused bulls. Bears may attack in case RBI maintains status quo on rates.